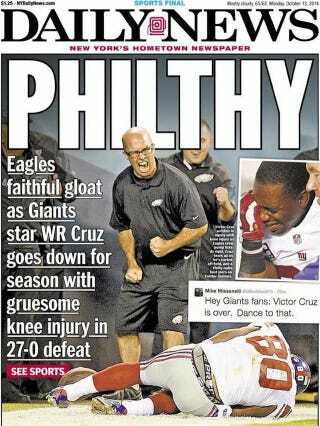 Up there is the front page of today's New York Daily News: a guy in an Eagles polo seemingly gloating over a crumpled, injured Victor Cruz on the ground. "PHILTHY," indeed. Of course, the photo captures only one frame. What do moving pictures show? It seems pretty clear he was cheering the drop and not, through some combination of clairvoyance and medical intuition, the injury. If our man here—an Eagles gameday employee known only as Charlie—had known immediately that Cruz had torn a patellar tendon, he'd probably be on the medical staff, or at least at a blackjack table in Vegas. If you still have doubts, NJ.com found more photos of Charlie from the moments after the drop, and wouldn't you know it, he acted like everyone not named Mike Missanelli. In the one below, you can make out Charlie's head, right above Cary Williams. He's evidently kneeling. There are plenty of terrible things and people in Philadelphia. We don't need to resort to making them up.